The John Herbert Ballantine estate built c. 1915 in Lawrence. Ballantine was the president of Neptune Meter Co. which later became Neptune International Corp. His grandfather Peter Ballantine was the founder of the Ballantine Brewery. Click HERE to see the J.H. Ballantine estate on google earth and HERE on bing. The side of the house on the post card faces Burton Lane, which even then was way too close to the house. It appears the "front" is now the opposite side, facing Meadow Drive ... & explains why the garage is at what is now the entrance to the property. It's a good looking house & well maintained; but really needs more space from Burton Lane. I am very surprised by the Bing map. It seems to indicate that the are is far less badly overdeveloped that I suspected. 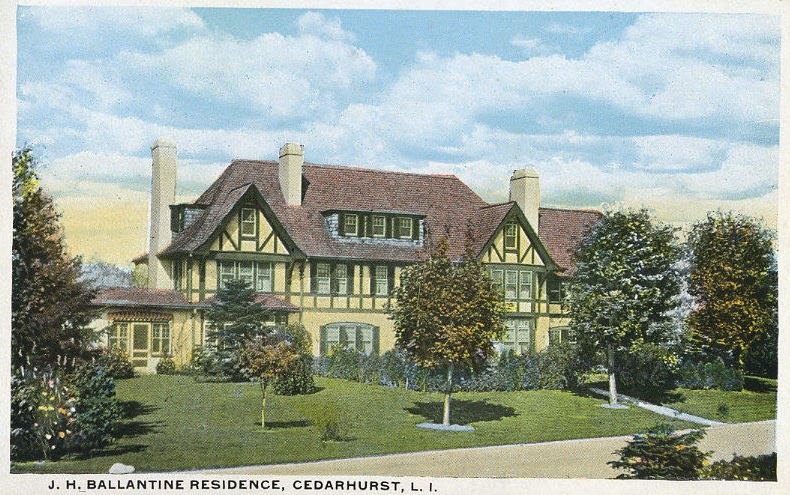 Prior to the Second World War, Lawrence and Cedarhurst were very much the equivalent of Locust Valley and Oyster Bay in terms of locales for the rich and social. After the War, the Social Register types seem to have fled the area en masse. I had always assumed that this was the result of encroaching and ill thought out suburbanization. That doesn't seem to have been the case. What I always heard from elderly family members was that it was the airport, as much as anything, that made living in Lawrence problematic. The problem with that, as a story, is that people starting leaving (as you say, for the North Shore) in the very early Thirties -- long before Idlewild took shape. It may be, however, that just the prospect of airplanes flying over was enough the begin the out-migration, and things just spiraled from there. Ancient- that makes sense- and yes, I, born at the dawn of commercial jet travel, well remember how loud those early jets were. Which reminds me- Prince Philip apparently just celebrated his 90th birthday, prompting several newspapers to re-print some of his more memorable quotes. One was delivered in a speech he gave to some senior engineers at a British aircraft firm. He congratulated them on the huge strides made in commercial aviation, "which now allow the flying public to travel the world in speed, undreamed of comfort and relative silence, unless you go in something called economy class which sounds absolutely ghastly". Right you are, Sir. Economy is still ghastly. As for Cedarhurst, what is it like now? The artist Victor White, a brother of Harper's Bazaar editor Carmel Snow, used to live there. looking at the area, it looks like airplanes are the least of their worries. how that little tract stayed undeveloped in the midst of that rat maze is a mystery to me. if it is the planes, i'd put a big sign on my lawn - FLY LOWER. What a corner of serenity left over from another time. nice house - amazing it survived. security word def - "eurla" - what long island is a cross between. Louis Auchincloss' father's family always weekended there and one biography stated that they moved out when jewish families moved in. LA denied this. Nonetheless, the area is very Jewish.